Krell Digital Vanguard USB Ethernet Streaming and Bluetooth Amplifier. Available with Online Finance and Free Delivery. The Krell Digital Vanguard’s amplifier section incorporates a massive power supply with a 750 VA toroidal transformer and 80,000 microfarads of storage capacitance. The tremendous amount of energy on tap provides 200 watts per channel into 8 ohms and 400 watts into 4 ohms. Two quiet, thermostatically controlled fans permit the use of a surprisingly compact chassis. The preamplifier section of the Vanguard borrows its balanced, fully discrete Class A circuit concepts from Krell’s top-of-the-line Illusion preamplifiers. 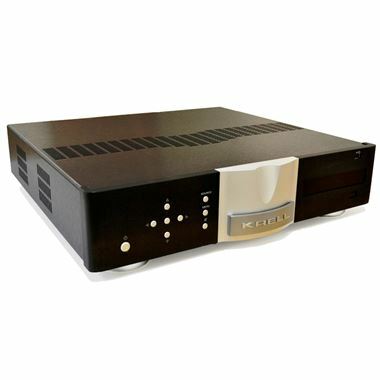 Krell’s Current Mode technology is employed to assure unequaled signal bandwidth, easily enough to handle the latest high-resolution PCM and DSD audio sources without impacting high-frequency response and detail. Packed with many of Krell’s most musical-sounding technologies, the elegant chassis is living-room-friendly. Yet it has enough power to achieve incredible, lifelike dynamics with any speaker. The front-panel menu system provides configuration features such as input naming and input trim. Theater Throughput mode lets the Vanguard serve as the core of a surround-sound system without sacrificing two-channel sound quality. Analog Inputs include three stereo RCA and one stereo balanced XLR. High-quality WBT speaker cable terminals provide a secure, electrically ideal connection. A key feature for the Digital Vanguard is its digital module, which includes USB, HDMI inputs and output, coax and optical digital inputs; Ethernet music streaming controlled through dedicated iOS and Android apps; and Bluetooth wireless for convenient streaming from phones, tablets and computers. The Vanguard also offers features that make it perfect for custom installation, such as 3.5mm jacks for IR input and 12-volt trigger input and output, as well as optional rack-mount ears. Additionally, the unit can be controlled with home automation systems or the Krell web server through its Ethernet connection.